29 September 2016. A synthetic material called hyperelastic bone is shown to produce replacement bone with a 3-D printer and in lab animals supports the growth of new bone without causing an immune response. The team of engineers and medical researchers from Northwestern University in Evanston, Illinois published its report in yesterday’s (28 September) issue of Science Translational Medicine. The researchers led by materials scientist Ramille Shah, on both the engineering and medical faculties at Northwestern, is seeking more options for bone replacements, particularly for children. Bone implants today usually require harvesting pieces of healthy bone from other parts of the body to replace missing pieces. Not only is the process difficult and painful for children, metal implants that may help adults will not often work with children, whose bodies are still growing. As a result, Shah and colleagues are investigating synthetic materials that resemble the strength and flexibility of bone, but can also be fed through a three-dimensional printer to produce custom-fitted pieces for patients. In addition, the material needs to be porous and support the growth of new natural bone in the recipient, a key requirement for children with growing bones. The hyperelastic bone produced by the Northwestern team is made primarily (90%) of hydroxyapatite, a mostly calcium mineral found in natural bone. Previous work with hydroxyapatite and similar ceramics shows them to be too brittle when fashioned into replacement bone tissue, and mixing in most polymers to provide elasticity tends to dilute hydroxyapatite’s natural bioactivity for supporting growth of new bone. In this case, the researchers mixed in biocompatible polymers polycaprolactone and polylactic-co-glycolic acid or PLGA, used increasingly in implants or for tissue engineering, which takes up the remaining 10 percent of the material. The team tested its hyperelastic bone with a 3-D printer, first formulating the materials into liquids, then printing specified shapes at room temperature. The researchers produced several pieces resembling human skull and jaw, as well as sleeves that could be fitted around human tendons, taken from cadavers, similar to procedures for anterior cruciate ligament, or ACL, repair in arthroscopic surgery. Tests of the 3-D printed pieces show they have suitable elastic properties, and could be printed at speeds as high as 275 cubic centimeters per hour. In addition, the printed pieces are 50 percent porous, enabling the pieces to act as scaffolds for regenerating new bone material. The team tested the material with adult stem cells derived from bone marrow and cultured in the lab for more than 4 weeks, regenerating into new bone without adding growth factors, proteins that aid tissue regeneration. 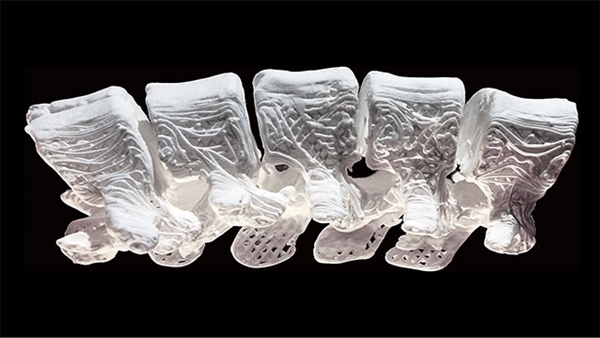 The researchers further tested 3-D printed pieces of hyperelastic bone with lab animals. A test with mice showed implanted pieces under the skin were biologically compatible for as long as 35 days. Another test with rats, created a pieces for a spinal fusion, a procedure for fusing small bones in the spine that enabled new bone growth for 8 weeks. A more complex procedure, replacing a defective piece of skull in a rhesus monkey with a graft of hyperelastic bone, made possible new bone growth for 4 weeks. In all of the animal tests, the implanted material integrates with surrounding tissue and supports blood vessel growth without adding growth factors. Moreover, none of the implants caused an immune reaction in any of the animals. Several patents were filed for the different processes invented in the study. The following video demonstrates and tells more about hyperelastic bone.